At the start of the century,Winning Shipping established operations in Hong Kong with the aim of providing maritime logistical services to the growing Chinese non-ferrous metal market. The company’s initial logistics services focused on ferrying raw materials for alumina production enterprises. Winning International Ships Management Co. Ltd was established, which is in charge of the company’s own ships and third-party ship management. trade services. Currently, the group has 12 subsidiary companies, including a shipping operation company, a ship management company, a trading company, a resource company and a ship owning companies. It also has three joint venture companies with its business partners. The companies are domiciled in China, Singapore, Indonesia, Hong Kong and other countries and regions. In 2012, the group integrated up stream to the design, construction and operation of Green Marine Logistics equipment: barge, transhipment and blending. Winning has become one of the leading carriers for alumina production enterprises in Asia, taking care of 90% bauxite material handling from Indonesia to China for the end users. The company is committed to the provision of door-to-door supply chain solutions for the manufacturing industries of tomorrow, starting from today. Winning’s mission is to provide maritime logistics solutions to global industrial and trading enterprises. It will work towards this mission by establishing the company as the leading logistics bridge between global resource production mines and industrial manufacturers in the Asia-Pacific region. In addition, as part of its corporate social responsibility,Winning strike to progress to environmentally friendly green assets to reduce its logistical carbon footprint. Winning Shipping’s core business areas are entrenched upon the provision of door-to- door integrated supply chain solutions. These include mining, supply side stockpiling, jetty design, barging, transshipment, ship charters, fleet management, lightering operations, end-user side stockpiling and land transportation. The company is experienced in the pragmatic setup and management of supply chain from mines to the industries’ doorstep by the adaptation of new technologies to tackle challenging operating conditions. Winning’s cornerstone operating principles are integrity and service. It firmly believes that by operating with integrity alongside the provision of service excellence, it can establish itself as the trusted provider of reliable logistics to its customers. It has successfully established itself as major oceanic carrier for most of the Chinese non-ferrous metal industries. In addition,Winning has successfully established itself as the maritime solutions provider of choice for the industry of non- ferrous metal in China. Its strong desire for staff innovation has created co-operative opportunities for the development of a business model re-engineering. As part of its development plans for the next decade,Winning Group aims to expand its geographical reach from within Asia to a global operation, and commodity-wise to iron ore and coal. Winning will continue to invest in innovation and the development of new sectors for growth including pioneering sourcing of resources (entrusted by the end users), provision of critical logistics services, sourcing and financing of mining and land transportation equipment for the producers and expanding towards the development of resources. With links stretching back to the turn of the century, Beltship Management Limited is a joint venture company that has been providing full ship management services since 1992. The partners in the joint venture are Globe Shipmanagement Ltd, a privately held company, and United States Gypsum Corp (USG), listed on the US stock exchange and an operator of vessels for more than 100 years. The structure of the business encourages attention to detail, providing a personalized service whilst its joint venture partner USG provides the necessary stability and peace of mind to its clients. As a technical management firm it specializes in self-discharging dry bulk carriers. The company’s initial interests focused on the undertaking of technical management of USG’s fleet whilst Globe Shipmanagement Ltd was responsible for the ships’ crew management tasks. In a direction change in 2008, Beltship Management opened its doors to third-party clients and expanded the scope of its activities. Grounded in tradition but constantly evolving, its goal is to offer a superior service by proposing solutions to fit its clients’ needs. Beltship Management has grown its business with two major clients as John McMillan, technical director explains: “Our client, Vale, has shown their trust in our management by providing two more vessels the Ore Timbopeba and the Ore Itabira in 2013. We are now in a position where we operate six vessels for the world’s largest iron ore producer. 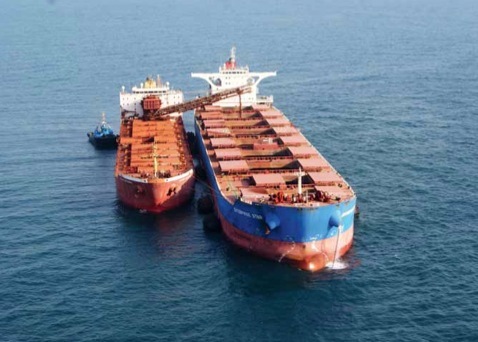 With another client,African Minerals, our contract to transship iron ore has been expanded from 12mtpa [million tonnes per annum] to 20mtpa.” To fulfil this expanded contract, Beltship Management has delivered to Sierra Leone a further two self-unloading bulk carriers, the Nelvana and the Argosy. Forming an aspect of the contracts, Beltship installed Inmarsat’s Fleetbroadband unlimited service in all six Vale vessels and also on the four vessels in Sierra Leone. The service provides the crew with free internet access and the ability to remain in touch with family and friends at home 24/7, which has greatly improved the crew’s morale. Beltship Management maintains quality assurance accreditation for its activities ashore, at its offices and on its vessels. The overall aim of the business is to provide safe, efficient and high-quality management services to its clients. In addition to compliance with all relevant legislation, and as continued commitment to the care of the environment and the prevention of pollution, Beltship Management has adopted the international quality standard ISO 9001, and the Environmental Management System ISO 14001. Adherence to these codes enhances effective application of the quality system, including processes for continual improvement and assurance of conformity for its clients. “The quality system is continuously evolving for effective application to company operations, for improving safety on board and ashore, and to minimize environmental impact wherever possible. To assist with this, we have recently invested in an all-in-one software solution, DNV Synergi Life, for managing all QSHE incidents, risk analyses and audits and inspections. The software uses systematic workflow to ensure corrective and preventative actions are reviewed and applied effectually, as well as monitoring trends to avoid reoccurrences and highlighting any opportunities for improvement,” explains McMillan. “As a company we offer transparent technical management with clear and concise information on budgets and technological requirements and maintaining of certifications. Through encouraging close co-operation and openness into all parts of our operation we have been successful in building and maintaining a competitive edge in the market,” says McMillan. The business has a proven track record in transhipment operation in particular, which has provided evidence in its ability to successfully provide a turnkey solution in difficult environments such as the existing operation in Sierra Leone. “We are prepared to invest in our infrastructure to provide the client with the information they require such as our major investment in Synergi which provides Vale with in-depth analysis of near misses and incidents and allows us together to better improve the safe running of the fleet,” he adds. In a separate contract, the business joined Shipserv to facilitate the procurement processes. Shipserv enables automatic interaction between the planned maintenance and purchasing system and the suppliers. Requests for quotes and purchase orders are automatically sent and received which saves valuable time and enables implementation of KPI’s for the purchasing process. Terex Port Solutions (TPS) strengthens its presence in Indonesia with three further Terex® Gottwald floating cranes. Winning Logistics Investments Pte Ltd (Winning), the logistics division of the Winning International Group based in Singapore, ordered the Terex® Gottwald Model 8 floating cranes in the G HPK 8200 B four-rope-grab variant for use off the coast of Kalimantan. The cranes will gradually start working there as of autumn 2014. Starting in June 2014, the cranes will first be delivered to China where the barges are built. There, the cranes will be connected to barges via their roller bearing slew ring at the shipyard. The floating cranes will then be towed to Kalimantan, the Indonesian part of Borneo, to help Winning handle bauxite on the open sea. With the commissioning of the three cranes, a total of eight floating cranes from Terex Port Solutions will be in operation off the coast of Kalimantan.Winning will be the fifth terminal operator on the open sea in the area. Bauxite, from which aluminium is extracted, occurs in abundance inside Kalimantan. On its way to the smelting works, including one operated by the Winning International Group in the West- Kalimantan province, the bauxite is first transported from the mining regions to the open sea on river barges. Here it is loaded onto seagoing vessels. To make future handling off the coast of the island more efficient,Winning is relying on floating cranes. The cranes are based on proven Terex Gottwald mobile harbour technology with similar features and capabilities. The G HPK 8200 B cranes provide a 63-t grab curve and a maximum hoisting speed of 140 m/min. They are powered by diesel generators installed on board the floating crane barges. Each barge also provides accommodations for 30 crew members, which includes dining and recreation rooms in addition to an operations center and a workshop. Built for use on the open sea, the three cranes for Winning are designed in accordance with Lloyd’s Register Code for Lifting Appliances in a Marine Environment which allow the cranes to operate at wind speeds up to 24m/s and maximum wave heights of 2.5m. Winning opted for cargo handling cranes that combine high productivity with flexibility, as Sun Xiushun, president of the Winning International Group, underlines: “With floating cranes from Terex Port Solutions, we have decided on a top-level technological solution. These cranes can also be used reliably under tough conditions and therefore help to significantly increase the total handling volume of our fleet.” He explains that after other solutions proved unsuitable,Winning has consciously opted for TPS in order to achieve its growth objectives. In regards to the barges,Winning also involved a third-party supplier to equip them with an advanced anti-rolling system to improve operational performance. This is the first time Winning used this system. The system is designed to allow the floating cranes to operate at maximum working speeds and help each crane to handle more than 25,000 tonnes of bauxite daily in the harsh, open-sea conditions. For Klaus Roehrig, Regional Director at TPS, the order from Winning is another important chapter in the success story of Terex Gottwald floating cranes in Indonesia:“The fact that we have sold eight cranes here since 2006 speaks volumes for the ability of TPS to offer high-performance solutions tailored to specific customer requirements and environmental conditions.” Roehrig is pleased to gain a new customer and that Winning has seen rapid development over its twelve years of existence, and is still clearly on a growth course:“Winning has become firmly established in South Asia, particularly in the transport and handling of bulk material. We are delighted that such a dynamic group is counting on three Terex Gottwald floating cranes based on our mobile harbour crane technology for its planned growth phases,” Roehrig continues. Since their market launch in 2004, floating cranes from TPS have quickly become accepted in various environments. A total of 33 of these cranes, including those for Winning, are or will be in operation worldwide. Apart from Indonesia, the majority of TPS’ floating cranes can be found on the Mississippi River in the United States. Similarly to Indonesia, US customers benefit from the flexibility, high-level performance and ease of servicing of the cranes due to the Terex Gottwald modular crane system design: in places where there are no, or only a few, quay facilities available,Terex Gottwald floating cranes in transshipment and ship-to-shore handling represent a competitive variant for handling all types of cargo. In addition to the open sea, they can also operate in ports, on rivers and in coastal waters. Terex Port Solutions is part of the Material Handling & Port Solutions business segment of Terex Corporation that supplies customers in ports with a unique combination of machines, software and services under the Terex and Terex Gottwald brands. Whether it is ship-to-shore cranes, reach stackers or fully automated, integrated handling systems for containers and bulk,Terex Port Solutions provides reliable solutions for rapid, safe, efficient handling of all forms of cargo with low downtimes and excellent return on investment. Terex Corporation is a diversified global manufacturer of a broad range of equipment that is focused on delivering reliable, customer-driven solutions for many applications, including the construction, infrastructure, shipping, transport, quarrying, mining, refining, energy, utility and manufacturing industries.Terex reports in five business segments:AerialWork Platforms, Construction, Cranes, Material Handling & Port Solutions and Materials Processing.Terex offers a complete line of financial products and services to assist in the acquisition of Terex equipment through Terex Financial Services. In a naming ceremony held at Yangfan shipyard in Zhoushan, China on April 24, 2014, CSL unveiled the names of its two newbuild Trillium-class bulk carriers. The first to be revealed was the CSL St- Laurent, named in honour of the mighty St Lawrence River on which CSL vessels have sailed for over 100 years. The second bulker, the CSL Welland, was named as a tribute to the Welland Canal, the intricate system of eight locks that enables ships to navigate to and from North America’s heartland. The 36,100dwt, Seaway-size gearless bulkers are part of CSL’s ambitious fleet renewal programme which oversaw the delivery of four new Trillium-class self- unloading Lakers and three Panamax self-unloaders in 2012-2013. The two new vessels are scheduled to enter the Canada Steamship Lines fleet later this year and will operate in the Great Lakes-St. Lawrence Seaway system. Featuring IMO Tier II-compliant main engines and the latest environmental and safety technologies, the state-of-the art new bulkers will be consistent with the high standards set by the Trillium Class of operational efficiency, reliability and environmental sustainability.